Interesting WWW Sites In & About Belarus: Don't Search For Anything -- All Is Already Found! Welcome to the Interesting WWW Sites In & About Belarus! The Republic of Belarus (or Belarus) is a new independent state that has been formed as a result of dissolution of the former USSR. The Republic of Belarus is situated in the heart of the Europe. In the North and in the East the Republic borders on Russian Federation, in the South on the Ukraine, in the West on Poland, and on the North-West with Lithuania and Latvia. Belarus has been inhabited since prehistoric times. The first people inhabiting that territory appeared 40 thousand years ago, the first settlements have arisen 27-24 thousand years ago. Until 1991 the Republic of Belarus was known as the Byelorussian Soviet Socialist Republic (BSSR). Now it is a member and also one of the founders of the Commonwealth of Independent States (CIS). The Republic is divided into 6 administrative provinces (Brest, Gomel, Grodna, Minsk, Mogilyov and Vitebsk Oblast) which in their turn are subdivided into about 120 administrative districts (Regions). As of 01.01.2007, the population of the Republic of Belarus was more than 9.714 million people. The Belarusians accounted for 81.2% of the total population. 72% of the population are living in cities and towns. There are 104 cities and towns in Belarus. 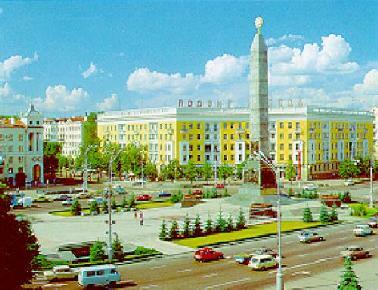 The capital city of Belarus is Minsk (1 million 781 thousand inhabitants as of 01.01.2006). The Republic Belarus has rich history and cultural traditions, and possesses a great economic, scientific, intellectual and spiritual potential. There are million Belarus oriented multilingual resources available now on the Internet. Therefore, the collection "Interesting WWW Sites In & About Belarus" presents only a part (some 5,000) of the fresh web links covering, nevertheless, overwhelming majority of that sort resources. To find out the various information about our country and people please visit the web sites listed below. This e-reference collection is maintained by Dr. Nikolai N. Kostyukovich, Head of the Department of the Presidium of the National Academy of Sciences of Belarus. The catalogue is always in developmental stage and updated almost every day. All changes in the list of pages are marked by New! on Site Map only. If you know interesting sites not currently included on the catalogue, please send your propositions. WorldHot Hottest Web Sites Award For This Site!